Canon has designed its full frame CMOS sensor with 22.3 megapixels, you can print it up to a2 size no problem. The new architecture of CMOS leads to a wider dynamic range and a low noise, as well as lower power consumption. Using the new DIGIC 5 + you can have with multiple exposure shots and HDR, as well as in-camera correction of chromatic aberration for each image, even shooting at full speed. EOS 5D Mark III uses the double-layer Canon iFCL metering sensor at 63 areas, connected to the 61-point wide-area AF system. “We are extremely excited to announce the highly anticipated follow-up to our EOS 5D Mark II, a camera which has been called a ‘game-changer’ in most professional photography and videography circles. The EOS 5D Mark III will carry on that tradition, delivering better and more advanced features, helping our customers achieve excellent image quality for stills and video.” said Yuichi Ishizuka, Canon’s general manager for imaging technologies. Some accessories that have been announced (more to come) are a Wireless File Transmitter capable of sending images to a computer over Wifi. It will also allow multiple cameras to sync to clocks. Then there’s also a GPS receiver named GP-E2 for location logging and increased timestamp accuracy. Many people out there will be glad to hear that Canon is not going to phase out the Canon 5D Mark II any time soon. 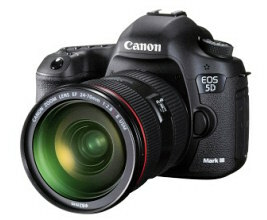 It has decided to keep it as a budget option for those who don’t want to splash out for the Canon EOS 5D Mark III. The Canon EOS 5D Mark III is the perfect camera for the photographer that refuses to compromise while capturing both stills and videos for their work. Initial pricing has been announced at $3499 for the body and $4399 with a EF24-105mm f/4L IS USM kit lens.